Summer is the season when your skin turns dark very quickly as compared to other seasons. Intense sun rays, sun tanning and excess production of melanin (skin darkening pigment) are some main causes for darkening of skin during summer season. When your skin is exposed to intense sun rays then your body naturally produce more skin melanin to protect your skin from the harmful effects of UV Sun rays. Although production of melanin may turn your fair complexion into dark complexion but it saves your skin from the adverse effects of UV rays. However, If you are unhappy with your dark complexion then go with given home remedies and get back your fairness. Take 4-5 almonds and soak them in some rose water for few hours. Now peel their skin and grind them with some milk to make a thick paste. Now apply this paste to your clean face and neck. Let this paste stay on your face whole night. Next morning wash your face with fresh water. You feel the difference even after first use. For best results repeat this process at least 2-3 times per week. Cucumber juice along with lemon and turmeric not only lightens your skin tone but also helps a lot in getting relief from sunburn. Take 2 tablespoons of cucumber juice and mix with 1 tablespoon of lemon juice and and a pinch of turmeric powder. Apply this paste on your clean and damp face for about 20 minutes and then wash off. This skin whitening face mask is good for oily skin in summer season but If you have dry skin you can add few drops of glycerine in this face mask and let it stay on your skin for same time period. Regular application of this mask will bring natural glow on your face. Take 1 tablespoon of sandalwood powder, 1/2 teaspoon of tomato juice, 1 teaspoon of cucumber juice and and 1 teaspoon of lime juice together. Mix all the ingredients and apply on your face and neck for about 20 minutes and then Wash with cold water. For best results repeat this on a daily basis. Take one tablespoon of milk powder, 1 tablespoon of honey , one tablespoon of lemon juice and 1 teaspoon of almond oil. Mix them well to make a paste and apply this to your face and neck. Let it stay for 15-20 minutes and then wash off. This fairness mask works best for dry and normal skin. If you have oily skin, instead of almond oil you can add few drops of rose water. To get fairer skin, take 2 tablespoons of gram flour powder, one tablespoon of yoghurt, one tablespoon of lemon juice and a pinch of turmeric powder. Now mix all the ingredients and apply this paste on your face and neck and leave for about 20 minutes. Finally rinse it off with lukewarm water. For best results repeat this procedure at least 3 times per week. A simple mixture of honey and lemon juice is very beneficial in getting fair skin. To lighten your dark skin tone you can make a paste by mixing equal amounts of honey and lemon juice. Apply this mixture on your face and neck and leave for about 20 minutes. Finally wash off using normal water. Potato and lemon both are excellent natural skin bleaching agents and helps a lot in lightening your skin tone. Take 1 tablespoon of Potato juice and mix with 1 tablespoon of lemon juice. Apply this fresh mixture on your face and neck. Let it stay for about half an hour and then wash off with fresh water. Regular application of this mixture will help in getting fair and flawless skin. Take 1 tablespoon of powdered oatmeal , 1 tablespoon of cucumber juice and 1 tablespoon of sour yogurt. Mix them well and apply on your clean face and neck for about half an our and then wash off with cold water. 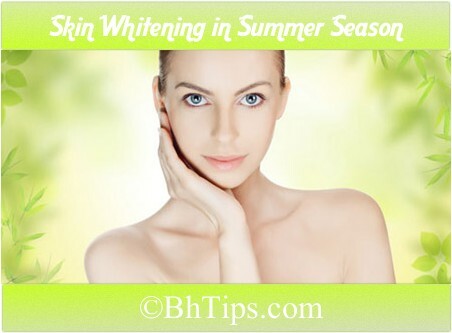 This is an excellent remedy to whiten and brighten your skin in summer skin. An other effective way to get fair skin is application of a mixture prepared by mixing oatmeal, curd and tomato juice. Take 1 tablespoon of powdered Oatmeal, 1 tablespoon of curd(yogurt) and 1 teaspoon of tomato juice. Mix them well and apply on your face and neck. Leave it for 15-20 minutes and then wash it off with lukewarm water and finally splash with and cold water and pat dry your skin. Take 2 tablespoons pulp of fully ripe banana, 1 tablespoon of honey and 2 tablespoons of sour cream. Mix them well and apply this paste on your clean face and neck. Let it stay for 20 minutes and then remove it with moist and soft cloth and finally wash off with fresh water. For best results repeat this 2-3 times per week. Tamarind contains amazing skin bleaching properties and helps a lot in getting fair skin even in summer season when chances of skin darkening are very high. To lighten your skin, boil some tamarind in some water and then extract its pulp. ( You can boil about 30 grams of tamarind in 100 ml of water and extract the pulp from it). Now take about 1 tablespoon of tamarind pulp, 1/2 tablespoon of lemon juice and 1/2 tablespoon honey. Mix them well and apply this paste on your face and neck. Let it stay for 15-20 minutes and then wash off. This skin whitening home remedy is very beneficial for bleaching your skin and aids in removing facial pigmentation marks as well as helps a lot in making your skin fair. As Sun tanning is one of the main cause behind darkness of skin during summer season so don't forget to apply a good Sunscreen before going out in sun. Apply screen lotion containing SPF 15 at least 30 minutes before going out. This will protect your skin from the harmful effects of UV Sun rays and will also prevent from sun tanning and skin darkening.